Russell Clark's painting shows New Zealand minesweeper HMNZS Kiwi operating in the Solomon Islands on 30 January 1943. On that day the Kiwi and its fellow minesweeper Moa sank a Japanese submarine. The Kiwi was damaged and the Moa was later sunk. New Zealand's two cruisers, the Achilles and Leander, also took part in naval operations in the Solomon Islands and were both heavily damaged. 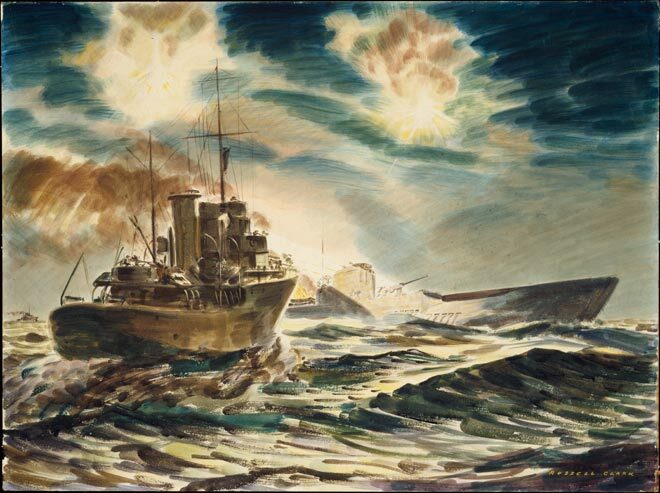 Russell Clark did not become an official war artist until 1944, and in February of that year he joined the 3rd division in the Pacific – so this work was clearly produced in retrospect.